The previous nAma, purandarah, and the following three nAma-s, aSoka,tAraNa, and tAra, are interpreted in terms of bhagavAn's guNa of removingthe fears of different kinds in us. Different vyAkhyAna-kartA-s haveassociated the different types of fears with the different nAma-s, but theunderlying idea is that His dayA is helping to remove these fears from us.SrI rAdhAkRshNa SAstri sums this up nicely - "Especially when we havedifficulties of any kind, chanting the sequence of nAmas"aSokas-tAraNas-tArah" will help us overcome these difficulties". SrIBhaTTar has referred to these fears in terms of AdyAtmika, Adi-bhautika, andAdi-daivika. 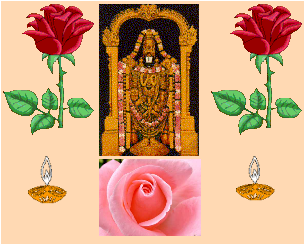 Adi-daivika is the class of fears that can arise from theasura-s etc. The Adi-bhautika group is the category of fears that canarises from enemies, animals such as tiger, lion, serpent, etc. TheAdyAtmika refers to the fears such as sorrow, delusion, hunger, etc.There is also the major fear, that of the cycle of birth and death, that ofsamsAra.One may wonder how bhagavAn helps in removing the fears of these kinds, whenwe know most of us have the fear anyway. The dharma cakram writer gives avery good explanation. Fear arises when we associate our life with ourbody. When we realize the true nature of our soul, then we know there isnothing to fear, because the soul is neither created nor destroyed. Whenone meditates on mahA vishNu, one realizes this true nature of AtmA, andthen he is relieved of all fears. This is how bhagavAn helps in removingthe fears described below.With this brief introduction, let us look at the individual nAma-s. The dispeller of sorrows.om a-SokAya namahSrI Sankara and SrI BhaTTar give differing but equally enlighteningvyAkhyAna-s for this. SrI BhaTTar points out that bhagavAn has this nAmabecause He is the dispeller of the troubles such as sorrow, delusion,hunger, etc. SrI Sankara gives the interpretation that bhagavAn is devoidof defects such as sorrow, delusion, hunger, etc., and so He has this nAma.In SrI BhaTTar's vyAkhyAna. this nAma is associated with His removing thesorrows of the adhyAtmika kind. The next nAma will be interpreted in termsof Adi-bhautika. nAma 336, purandarah, which was covered last week, coveredthe category of sorrows designated as Adi-daivika. Thus, the sequence ofnAma-s purandarah, aSokah, tAraNah, and tArah, are interpreted as His guNaof protecting us from all the different kinds of fears. He who takes others to the other shore (a boat).om tAraNAya namah.tArayati iti tArah - One who helps in crossing. The interpretation thatSrI BhaTTar gives, continuing on the vyAkhyAna he gave for purandara andaSoka, is that this name refers to His assisting us in overcoming the fearsgrouped as Adi-bhautika. SrI BhaTTar reserves the explanation that He helpsin crossing the ocean of samsAra for the next nAma, tAra, whereas SrISankara associates the current nAma with this guNa of bhagavAn.SrI cinmayAnanda seems to make a subtle suggestion that tAraNa refers tobhagavAn "helping" others crossing the ocean of samsAra, whereas the nextnAma "tAra" refers to His saving others Himself. I wonder if the differenceis one of throwing a stick to someone who is drowning but trying to swim,vs. pulling out the drowning person when he has given up swimming. This isthe kind of distinction that is made sometimes between how the person who ispersuing the bhakti mArga for attaining moksha is helped by bhagavAn vs. onewho is following the prapatti mArga. The Savior.om tArAya namah.SrI BhaTTar's interpretation is that He is tArah because He makes Hisdevotees cross over the ocean of samsAra. The following quote fromatharva-Siras (4) - "garbha-janma-jarA-maraNa- samsAra sAgara mahA bhayAttArayati tasmAt ucyate tArah" - One who takes His devotee across the greatfear of the ocean of samsAra consisting of garbha-vAsa or conception, birth,aging, and death. The Valiant.om SUrAya namah.This nAma is derived from the root "Su" to go, and signifies the urge forvictory. Perhaps to emphasize the "go" aspect of this nAma, SrIv.v.rAmAnujan gives examples from divya prabandham which illustrate the"go-get" nature of His victories. "SenRu a~ngu ten ila~ngai SeRRAn" -tiruppAvai; "SenRu a~ngu vANanai Ayiram tOzhim tenRit tiSai tiSai vIzhaccheRRAi" - periYAzhvAr tirumozhi 5.3.4 (Note the choice of the word "SenRu"in both examples).The dharma cakram writer illustrates the significance of this nAma for ourday-to-day life. He points out that whenever there is battle between thedeva-s and asura-s, the asura-s invariable win first, and then the deva-sseek the help of mahA vishNu who then helps them defeat the evil asura-s.Our life is a replay of this scenario, with the constant battle between thebad qualities in us and the good in us. Invariably, the bad will win outunless we seek the help of mahA vishNu by chanting His nAma. This is whatwe should learn from this nAma. a) The son of valiant people like vasudeva, dasaratha, etc.b) The grandson of SUra, the name of vasudeva's father.c) The descendant of the group of people called SUra-s in the yAdavarace.om Sauraye namah.The above different interpretations are found for this nAma based on thedifferent vyAkhyAna-s. The first is from SrI parAsara BhaTTar and otherswriters who base their vyAkhyAa-s on SrI BhaTTar. The second is from SrISankara. The third is from SrI rAdhAkRshNa SAstri. In support of thefirst interpretation, SrI v.v.rAmAnujan points out the valor of nandagopan -ODAda tOL valian nadagOpan kumaran, the valor of dasaratha - dayaraRkkumaganAit tOnRi - born as the son of the valiant dasaratha, etc.SrI Sankara's interpretation is that bhagavAn in His incarnation as kRshNawas born as the son of vasudeva, whose father's name was SUra. SUrasyagotrApatyam pumAn Saurih or SUra kulodbhavAt Saurih. SrI rAdhAkRshNaSAstri points out that among the yAdava-s, there was a group who were calledthe SUra-s. Since vasudeva was from this group, kRshNa is Saurih. The Lord of the people.om janeSvarAya namah.janAnAm jantUnAm ISvarah janeSvarah - The Lord of all things that are bornor created. The dharma cakram writer points out that bhagavAn is the Leaderof everything by guiding them always as appropriate. When there issuffering, those that meditate on Him benefit by those sufferings byreaching higher levels, and those that don't benefit fall to lower levelstill they reach a point when they feel they need to seek Him. At this pointHe guides them appropriately to the higher levels. SrI satyadevo vAsishThagives the interpretation that He is janeSvarah because He gives aiSvarya orwealth to people. One who is within bounds.om anukUlAya namah.kUlam means shore. kUlam anuvartate iti anukUlah - One who is constrainedby the limits. Lord rAma had great valor, but was not was conscious andwonder-struck about that - "vIryavAn na ca vIeyeNa mahatA svena vismitah".SrI P.B. aNNa~ngarAcArya svAmi explains that in spite of His enormous andunbounded greatness, He is easily accessible to those who seek Him. He isbound by bhakti, and this is His AnukUlya svabhAva or ability to be withinbounds. SrI v.v.rAmAnujan points out the incident of His being bound byyaSodA - being within the bounds of what a child is supposed to be -kaNNInUN SiruttAmbinAl kattuNNap paNNiya peru mAyan. Aycci kaNNIkkayiRRinAl kaTTat tAn kaTTuNDirundAn - mUnRAm tiruvantAdi - 91. Withoutknowing His identity, YasodA challenges Him - Make yourself free if you can! - "yadi Saknoshi gaccha tvam ati ca~ncala ceshTita!" - and He just remainstied, because He is anukUlah.SrI cinmayAnanda gives the interpretation that He is anukUlah because Healways goes along with whatever anyone does. Thus a murderer commits hismurder, and another helps humanity, and bhagavAn just is the Observer inboth cases. He keeps Himself within His bounds. SrI rAdhAkRshNa SAstrigives the meaning that anukUla means going towards the shore, based on kUla= shore. bhagavAn is anukUla because He helps His devotees go towards theshore when they try to cross the ocean of samsAra.The dharma cakram writer points out that bhagavAn is always acting His roleas an anukUlah to everyone (including the murderer in the above para) bybeing the internal conscience of everyone and telling them what is right.The inner conscience is always pointing to what is right and what is wrong.Those who obey their inner conscience do not do anything that will benegative to their path of progress towards Him, and those who disobey theirinner conscience deteriorate and move away from Him. But He does His job ofbeing the anukUlah in everyone's case all the time by being their innerconscience. a) He who has several incarnations to sustain dharmab) He whose wealth is bubbling but not overflowing (like vortices)c) He who maintains and manages several cycles - the cycle ofsamsAra for all the beings, the cakra-s of graha-s, nakshatra-s etc.om SatAvartAya namah.Sata means hundred. Here it means innumerable. For the protection ofdharma in the world, He takes infinite varieties of forms or incarnations,and so He is called SatAvarta (SrI Sankara). Recall "dharamasamsthApanArthAya sambhavAmi yuge yuge". Another interpretation, also bySrI Sankara, is that it refers to the 100 nADi's or vessels that proceedfrom the heart and maintain prANa or life in the body - nADI-Sate prANarUpeNa vartata iti vA.dharma cakram: There are several examples which illustrate His guNa ofSatAvarta. He appears in the form of the sun everyday in order to sustainlife in this world. SrI satyadevo vAsishTha gives the reference to atharvaveda - sUryasya AvRtam anvAvarte - 10.5.37. His repeated incarnations inhuman form to protect dharma in this world is another example. Hisprotection of pAnDava-s and draupadi repeatedly when they were in distressis another example. He protected draupadi from duryodhana's evil act ofstripping her in public, from durvAsa's curse when he tested her byappearing in her house and asking for food after she had cleaned the akshayapAtra, etc. He protected prahlAda from all cruelties meted out to him byhiraNyakaSipu. He did many wonders by protecting the yAdava people in Hisincarnations as kRshNa.Avarta also means vortex. Since His riches (aiSvarya) are so enormous thatthey keep expressing themselves without overflowing like hundreds ofwhirlpools, He is called SatAvarta (SrI BhaTTar). In spite of this, He iseasily accessible to His devotees. This corroborates the Mantra of thepara-aspect of the Lord - SAntodita vij~nAna prANAya - Unto Him of tranquiland ever-growing knowledge and life.SrI satyadevo vAsishTha uses the meaning "many" for Sata, and cycle (cakra)for Avarta, and gives the explanation that bhagavAn has this nAma because Herotates or cycles the lives through cycles of samsAra. Another way to lookat this nAma is that He controls different kinds of cycles - nakshatracakra, rASi cakra, graha cakra, etc.The aspects of para-vAsudeva with reference to His qualities have beendescribed so far (from the 334th nAma - vAsudeva). Now begins the rUpa orform of para-vAsudeva in SrI BhaTTar's interpretation. He who carries the lotus in His hand.padmam is what He carries in one of His four hands (Sankha, cakra, and gadAare in the other three hands). The lotus signifies the sAttvic qualities ofbhagavAn viz. dharma, j~nAna, vairAgya, and aiSvarya (SrI rAdhAkRshNaSAstri). He refers us to SrImad bhAgavatam - itareNa dhunAnam abjam - withthe other hand He is playing with the lotus (10.23.22). The padmam issuggestive of His always being ready to welcome anyone who comes to Him.SrI cinmayAnanda points out that bhagavAn first blows His conch and invitesus to offer His "knowledge" - signified by His padma, and if they don'tlisten to this, He uses His gadA to give a gentle knock, and if this doesnot yield results, then there is the cakra, which annihilates the evil andrestores order again. One is reminded of sAma, dAna, bheda, and danDa.SrI satyadevo vAsishTha uses the meaning "knowledge" for the word padma, andsuggests that one who gives True Knowledge or one who has True Knowledge ispadmI. One who has eyes which resemble the lotus.om padama-nibhkshaNAya namah.This nAma describes the cool, benevolent, kind, inviting, consoling,appearance of His eyes, which look like the lotus flowers. SrIv.v.rAmAnujan provides references from prabandham - "un mugam maiyyal ERRimayakkum mAya mandiram tAn kolO? ceyya tAmaraik kaNNinAi" - nAcciArtirumozhi 2-4; "uvagaiyAl ne~njam uLLurugi un tAmaraik kaN vizhigaLin agavalaip paDuppAn" - tiruvAi mozhi 6.2.7.SrI rAdhAkRshNa SAstri points out that the sequence of nAma-s anukUlahSatAvartah padmI padma-nibhekshaNah all refer to the quality of bhagavAn'shelping nature when one seeks His help.The dharma cakram writer reminds of the saying "The face is the index of themind". In this case, bhagavAn's lotus-eyes are conveying to us His InnerNature. The equivalent of this nAma in tamizh is "tAmaraik kaNNan".